If you like to stay active and fit but are always on the go or traveling a lot, I have the perfect workout product for you today! It allows you to stay strong, build muscle, but it travels great and barely takes up any room! Plus, it is a quick but effective workout. It is The Slide Effect and we are loving the The Slide Effect that we received! Grasp fitness in the palm of your hand whether you are on the go or at home with The Slide Effect, an innovative, compact, all-in-one workout system, designed to give you a full body workout; anywhere and anytime. No excuses. Created by a USA National Champion athlete and coach, Brandon Larcom, The Slide Effect was developed to give you the body you want in 1/3 of the time of traditional workouts. The secret is max quad training achieved by simultaneously combining four essential forms of exercise for absolute power - cardio, resistance, toning, and stretching. Conquer your core while experiencing personalized head-to-toe workouts using the power of stretch and resistance with 360° omni-directional sliding handles and custom padded docking station. The Slide Effect leverages instability during gravity-defying cardio and resistance training. Gain the edge with less training time. The Slide Effect comes with an instructional Full Body 360 DVD. Follow along adjusting the resistance for personalize full body workouts. The exercises develop lateral muscular training and challenge the stabilizer muscles in your core, hips, and shoulders; resulting in improved muscular balance. Because you work even your weakest link, power performance increases as well as injury prevention as muscles lengthen and stretch. The product also comes with yoga bands for extra lower- and upper-body stretching, a user manual, nutrition plan, workout guide, and bonus workout DVDs. As a busy mom in between homes, I don't have any of my normal workout gear (everything is in storage!!) or the normal space and time I wish I had! That is why I absolutely LOVE The Slide Effect and what it offers: a quick, effective workout without tons of equipment and lots of space needed! With The Slide Effect you can workout at home or take your workouts with you, its smart compact design fits in a briefcase and even a purse. Now, you can take your workouts further and get the body you deserve. Buy It: You can purchase The Slide Effect system for $149.85 at https://TheSlideEffect.com/product. 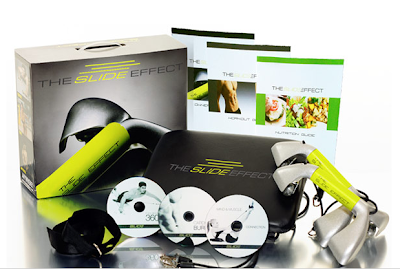 Win It: The Slide Effect is generously offering (1) The Slide Effect System to a lucky winner!